Okinawa Governor Onaga met LDP Secretary-General Toshihiro Nikai at the Okinawa Prefectural Office. 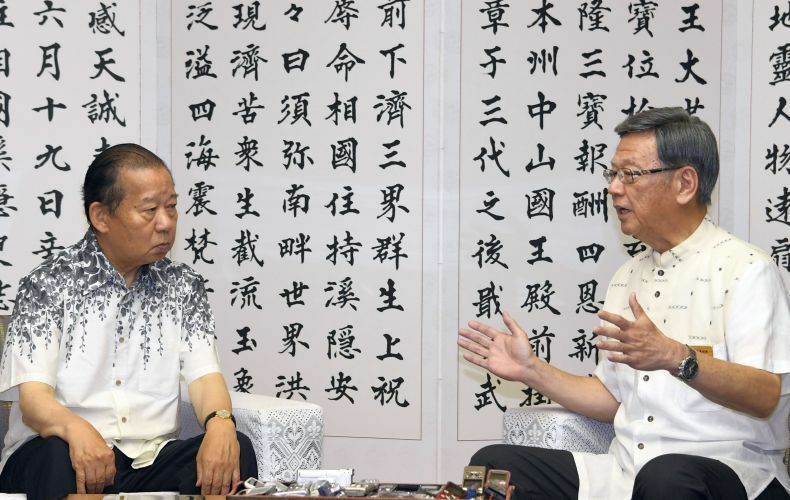 On the morning of September 14, Okinawa Governor Onaga met Secretary-General Toshihiro Nikai of the Liberal Democratic Party of Japan (LDP) during his visit to Okinawa, at the Okinawa Prefectural Office. Onaga said, “Okinawan and Japanese governments have strained relations on U.S.military base issues. I would like the LDP side to respond to the difficult situation Okinawa faces, and ensure the discussion on the issues is carried out smoothly.” Onaga handed Nikai a paper containing various demands, including cancellation of the Henoko relocation plan. In the paper, Okinawa called on the Japanese government to 1) secure the Okinawa promotion budget, 2) amend the tax system. 3) cancel new U.S. base construction in Henoko, move Futenma Air Base outside of the prefecture, return the land occupied by the base as soon as possible, and remove the danger posed by the base, 4) expand berths for cruise ships, 5) upgrade soccer stadiums for J1 league 6) take measures against traffic gridlock, and 7) support national health insurance projects for municipalities. Prior to the meeting with governor Onaga, Nikai met representatives of Okinawan economic organizations. Nikai then had a dinner with Onaga and others, visited a new berth for cruise ships in Naha Port, Onoyama Athletic Park before returning to Tokyo.